1968-ford-mustang-bullitt-steve-mcQueen-poster – Probably this is the only unmodified movie Mustang ever. It has massive 325 HP, a real American muscle car’s heart under the hood – the aggressive 6.4 liter V8 engine, 4-speed manual transmission [which definitely looks hard to shift] and sporty rear wheel drive to have fun while cornering. What else do you need from a real muscle car for chases, especially back in 1968? 1970-dodge-challenger-rt-vanishing-point – This one was a hot model with outrageous 375 HP, 440 cubic [7.2 liter] V8 which plays probably the sweetest automative soundtrack. Would You manage to find a better car for Kowalski to drive from Denver to San Francisco in 15 hours? eleanor-mustang-1967 – Eleanor is probably the most copied muscle movie car ever to appear in screens. Even though the original movie from 1974 was a hit, the 2000 stole the show for sure. There were 11 Eleanor units built for this movie and only 3 of them were actual running and driving cars. In the movie it acted as Shelby, but really they were modified Mustang fastbacks. The movie transmission was a 4-speed manual, but the stunt cars were automatic for easier act. Real legend. ford-falcon-interceptor-back-mad-max – This was was the most modified car in that movie. XB GT Falcon was built exclusively for Australian market and there were only 949 units built. It came with 351 Cleveland engine and 4-speed manual transmission The movie car kept most of the original interior, but body had some serious changes: new nose design, rear spoilers, Weiand 6-71 supercharger with Scott injector had, 4-barrel carburetor and the Zoomies – side pipes. Australians are proud of this car and also make replicas of it. Dodge-charger-from-bullitt – This triple-black, 4-speed Charger chased the Mustang in the “Bullitt” movie and made one of the greatest car chase scenes ever filmed. When the jumping act was performed over the San Francisco hills the Charger never failed with the suspension. Would you be able to name a car from nowadays that could do that without ending as scrap? mercury-monterey-from-cobra-2 – Cobretti’s [Sylvester Stallone] 1950 Mercury is probably the most important thing in the whole movie. It was formerly owned by Stallone himself and later built for the movie by Cinema Vehicle Services. They double-scooped the hood, cleaned all extra trim, fitted 383 Chevrolet small block, topped it with nitrous-aided 4-barrel Holley carburetor which also had Weiand 144 supercharger. The transmission was a 400 Turbo Hydraulic with 4-wheel brakes. A good car to reveal Cobretti’s personality and join this Top 10 list. aston-martin-db5-james-bond-movie – The DB5 is famous for being the first and most recognised movie car in James Bond movies. DB5 had 4 liter [282 HP], 5-speed transmission. Originally, Ian Fleming [the novel writer] had placed DB Mark III, but DB5 was the newest Aston at that time. 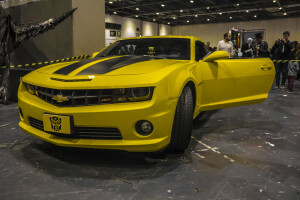 In fact, they used the prototype car and fitted it with lots of weaponry that fat stripped after the movie and resold. The same car showed up in a few other Bond’s movies as well. If You’d ask someone to say “what Bond’s car is”, the one would definitely name Aston Martin. Good car for good agent. 1957-ford-fairline-500-thunder-road – The movie character actually drove 2 cars there – 195 Ford Coupe and 1957 Ford Fairline 500 which was the top of the Ford line. The 312 cubic V8 engine produced 245 HP and had automatic transmission. Good choice for 1950s if You really need “to take someone out”.